There are many ways to preserve food and one of the easiest is dehydration. As we move into the fall months, I usually find myself dehydrating more than any other time of the year. This is partly because I am harvesting the last of my garden and I’m ready to shift away from canning into other forms of preserving. And it’s partly because it is the beginning of apple season! 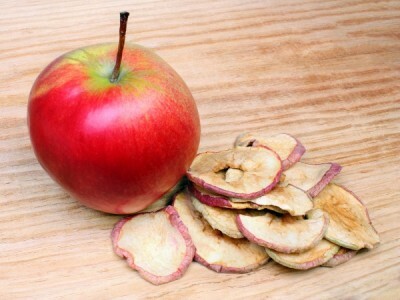 Apples are amazing when dried. They make great snacks and yet they still retain their fiber and nutritional value. 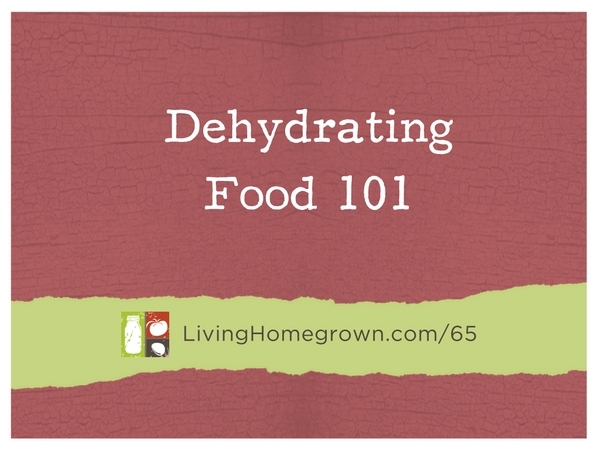 Of all the ways to preserve food, I think dehydration is one of the easiest. It’s very simple and safe. You can dehydrate everything from herbs & fruit to vegetables and even meat. But for this episode, I am going to keep it at the introductory level and talk about the basics of dehydrating while focusing on dehydrating a fall fruits: apples. However, all the basics of dehydrating can be carried over into preserving all the other foods mentioned. There are just small adjustments or technique shifts for the other foods which I can cover in further episodes. Can you get away with the least expensive dehydrator? Dehydrating is simply the process of removing the water from a food. This is done by exposing the food to just enough heat to cause the water to evaporate but not enough to actually cook the food. It also requires good air circulation to carry away the moisture. To be successful, you really need those two elements combined. By removing water from the food, we are deactivating the enzymes and bacteria that cause spoilage. Did you catch that I didn’t say we kill the bacteria? The act of removing the water doesn’t kill the bacteria and enzymes that cause the food to spoil. It just puts them into hibernation – just like refrigeration and freezing does. And since such low heat temperatures are used, it means the process also preserves a lot of the nutritional value of the food. With the exception of Vitamin A and C which are lost a bit during dehydration, most of the other vitamins and minerals are retained. Other advantages of dried foods are that it takes up less space in storage, is easily portable and uses less energy than a freezing or refrigerating. Many people wonder if you can you get botulism from dehydrating. The answer is no – because the botulism bacteria needs moisture in order to reproduce. So once a food is adequately dried, botulism is not an issue. Dehydrating, like all preserving, is best done with high quality produce. It’s not a good idea to use immature or over mature fruit. Doing THAT will give you less than desirable results. Just like all cooking – you get the best results when you have produce that is ripe, delicious and is good quality – meaning it is not bruised or soft or mushy. In other words, dehydrating will not make the produce or food suddenly become better quality. So start with the good stuff to get the best results. When it comes to flavor, one thing that is awesome about dehydrating food is the flavor of that food is intensified. It makes sense when you think about it – the food is more concentrated because the water has been removed. This is why a dried apricot or a dried grape tastes so sweet and delicious. There is more flavor packed into that tiny package. The thing that is also nice about dehydrating is you really don’t HAVE to have special equipment. Now, I DO think having a simple dehydrator makes the job super easy. And for that reason, I do recommend buying a dehydrator (even an entry-level model) if you have any desire to do multiple batches of food. They are many inexpensive models out there. But if you want to give it a go without equipment, you can dehydrate food with the sun or your oven. For today’s episode, I’m going to focus on dehydrating with an electric dehydrator. But I have links below for sun drying and oven drying – in case you want to try it. So what is an electric dehydrator? It’s simply an electrical device that holds the food on racks and heats up to a low temperature while circulating the air for evaporation. It has a heating element and a fan inside. They come in all shapes and sizes and in all price ranges. A small inexpensive model that is a great starter dehydrator is the Presto or Nesco brands. These two brands run $35-65 and up. Just look for whatever features are most important to you. The Cadillac of dehydrators is the Excalibur. It has large capacity trays, lots of adjustments to temperature and humidity and a timer. Excalibur models run $100 for the smaller model, up to $325 for the deluxe model. So they may be something you would work up to if you decide you really like dehydrating. You can certainly get a lot of dehydrating done with the lower end models. They work well. I have had several dehydrators in my life and I currently have an Excalibur. But I worked my way up to that size and price point. If you are looking at inexpensive models, I like the type of dehydrators that stack or expand to the size you need. That way, you are only heating the space you have to and you can do small batches efficiently. Here are the simples steps discussed in the podcast for drying apples. At this point you can go straight into the dehydrator if you wish, or you can treat the apples to prevent browning. Place on the tray of your dehydrator and follow manufacturer instructions. It should take 6-12 hours to dry. The apples are done when they are down to about 20% moisture. They will be dry to the touch, not sticky but still pliable. Let the apples cool completely before sealing in baggies or air tight containers. Label, date and use within 1 year if possible. Dehydrated food is still safe after 1 year, but the color, texture and nutritional value starts to diminish after that time. Very helpful and informative. Thank you. I loved this podcast! I have never used my dehydrator and this information is wonderful! I always thought it would be a major project but not at all. I’m super anxious to start dehydrating fruit for my granddaughter’s snacks as well as craft projects. I used mine to make beef jerky. I know I dried it long enough, but it still molded. Can you please tell me why. Hi ER – It’s hard to say since I do not know what equipment you used, the thickness of your slices, how you stored the meat after dehydrating or if you did any treatments to the meat prior to dehydrating. However, typically when meat molds after dehydrating it is because there is too much moisture in the meat. This can happen from un-even slicing or slices being too thick. If one slice has moisture and it is stored with the others, it will cause all of them to mold. Also, it is possible that you dehydrated properly but there was a break down in the storage of the meat. Any dehydrated food will absorb moisture in the air if left out for any period of time before sealing in an air tight container. Another issue can be that the meat was packaged while still warm (and it was still off gassing moisture. Hope that helps.